As an example for numerical integration we choose the sine function y = sin x ; its graph is shown in blue. The definite integral is to be calculated between an initial abscissa x1 and an end abscissa x2. Its graph is shown in red, with C as the initial value at the initial abscissa. The analytic definite integral is -(cos x2-cosx1). It corresponds to a point on the analytic curve at the end abscissa x2. In the approximate numerical calculation the interval x2 - x1 is divided into n sub intervals of width delta. For clear demonstration of the principle n = 2 is chosen. Arrows show the value of the function in the three points of the double interval 2 delta. Three numerical algorithms are visualized in three windows. They differ in how the approximative value of the function is defined between consecutive points in the sub interval delta. 1.) Rectangle approximation: y is taken as constant within the interval. The contribution of one interval is delta * y1. 2.) Trapezoid approximation: y is taken as the mean value within the interval. Its contribution is delta*(y1+y2)/2. 3.) Parabola approximation: the function in two consecutive intervals is approximated by a second order parabola through both end points and the middle point of the double interval (a parabola needs three points to be uniquely defined). The contribution of the double integral, derived as a surprisingly simple formula, is 2*delta*1/6(y1+4y2+y3). The simulation calculates the sum of two approximating intervals of width delta using the three algorithms. Their respective values are represented by the green points. 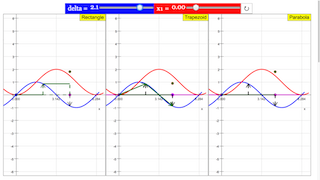 A first slider defines the interval delta, a second one the initial abscissa x1, reset defines delta = 1 and x1 = 0.5. Compare how well the three procedures approximate the analytic solution. E2: Draw the initial value with the mouse. Observe the shift of the analytic solution, and its relation to the result of the different algorithms. Explain mentally to some non professional what you observe! E4: Reduce the interval width and observe how fast the approximations converge to the analytic solution. E4: Keep the interval small and approximately constant while drawing the initial point. Observe whether the differences of the algorithms are comparable for all initial points. Interpret the result! E5: For special initial points the simple algorithms result in exact agreement with the analytic value, while the parabola algorithms shows a recognizable deviation. Does this mean that the simple ones are better? What is the reason for identity in these cases? Adjust the sliders to move the delta and x1 accordingly.